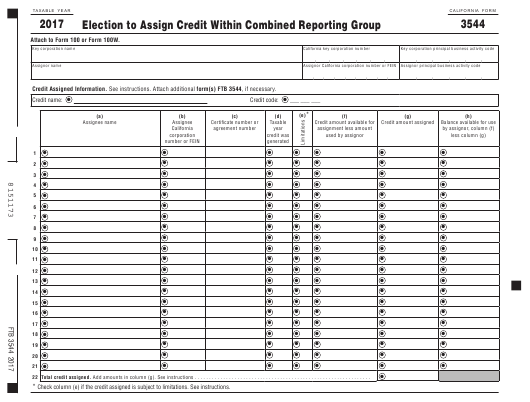 Form FTB3544 or the "Election To Assign Credit Within Combined Reporting Group" is a form issued by the California Franchise Tax Board. The form was last revised in January 1, 2017 and is available for digital filing. Download an up-to-date Form FTB3544 in PDF-format down below or look it up on the California Franchise Tax Board Forms website. Step-by-step Form 3544 instructions can be downloaded by clicking this link. Attach to Form 100 or Form 100W. Credit Assigned Information. See instructions. Attach additional form(s) FTB 3544, if necessary. 22 Total credit assigned. Add amounts in column (g). See instructions . . . . . . . . . . . . . . . . . . . . . . . . . . . . . . . . . . . . . . . . . . . . . . . . . . . . . . . . . . . . . . Check column (e) if the credit assigned is subject to limitations. See instructions.